NETWORK FINALS: BIG BROTHER gained 0.1 in final numbers, and CANDY CRUSH lost the same. The season finale of AMERICAN GRIT was rated as 2 separate hours in finals, respectively 0.3/0.4. CABLE HIGHLIGHTS: Score it at Dragons 1, Sharks 0, as Syfy’s SHARKNADO 5 fell 0.25 from last year’s installment (which faced THE NIGHT OF on HBO) to 0.57. The era of Kardashian-related programming isn’t over, as E!’s LIFE OF KYLIE premiered with 2 episodes at 0.51/0.49, raising FAMOUSLY SINGLE by a tenth to 0.25. On Showtime, RAY DONOVAN returned at 0.24, down 0.04 from the 2016 premiere (which aired against the GAME OF THRONES season finale) and down 0.12 from last year’s finale, with the shifted TWIN PEAKS up 0.02 to 0.08, and I’M DYING UP HERE was down 0.01 to 0.04/163K. Hallmark’s CHESAPEAKE SHORES had a 0.24 season premiere. A dragon-fueled hour of HBO’s GAME OF THRONES continued to amaze, up three-tenths from last week to 4.60, just 0.11 off the pace of its record-setting season premiere. This continued to be wonderful for the just-renewed BALLERS (down 0.14 to 1.12) and INSECURE (down 0.06 to 0.60), while LAST WEEK TONIGHT was up 0.04 to 0.71. Adult Swim’s RICK & MORTY lost 0.22 from last week’s season premiere to 1.26, with DECKER: MINDWIPE down 0.14 to 0.41, and APOLLO GAUNTLET down 0.09 to 0.31. Starz’s POWER eased down by 0.03 to 0.75. TNT’s CLAWS lost 0.05 to 0.51. FX’s THE STRAIN jumped a tenth to 0.43. MTV’s TEEN WOLF dropped 0.03 to 0.23. Unscripted was led by NBC Sports Net’s NASCAR race at 0.62. 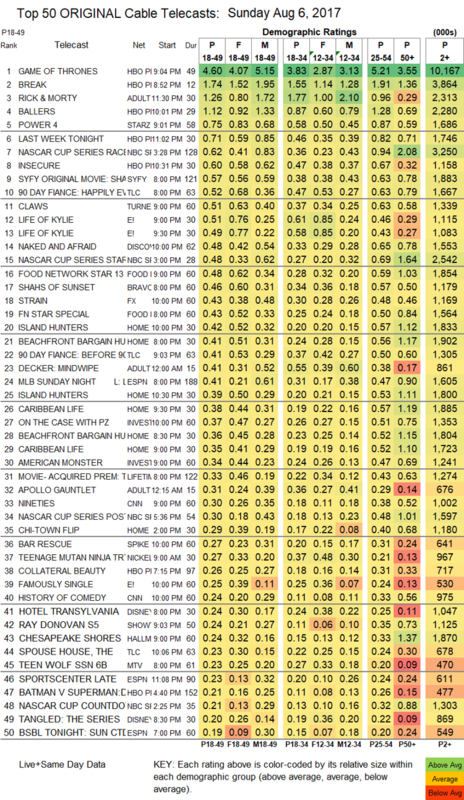 On TLC, 90 DAY FIANCE ticked up to 0.52, with an AFTER-SHOW at 0.41, and SPOUSE HOUSE was up 0.03 to 0.23. 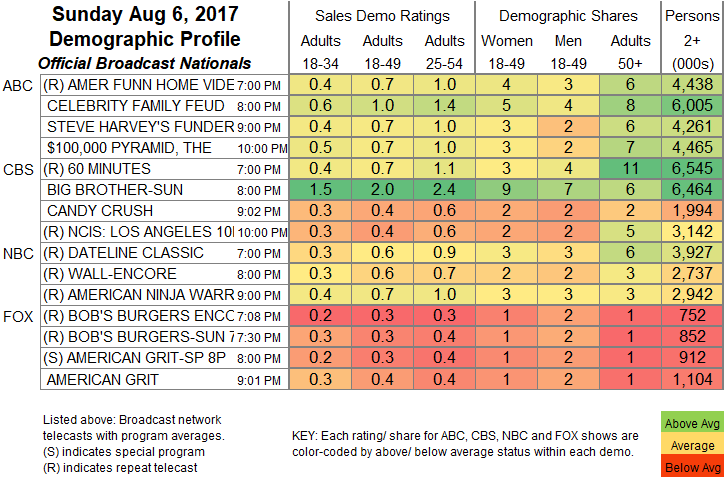 Discovery’s NAKED & AFRAID slipped 0.02 to 0.48. On Food Network, FOOD NETWORK STAR rose 0.06 to 0.48, preceded by a related special at 0.43. Bravo’s SHAHS OF SUNSET gained 0.03 to 0.46. HGTV’s line-up was led by ISLAND HUNTERS at 0.42/0.39, compared to last week’s 0.37/0.36. On ID, ON THE CASE climbed 0.09 to 0.37, and AMERICAN MONSTER was up 0.05 to 0.34. Spike’s BAR RESCUE edged up 0.02 to 0.27.